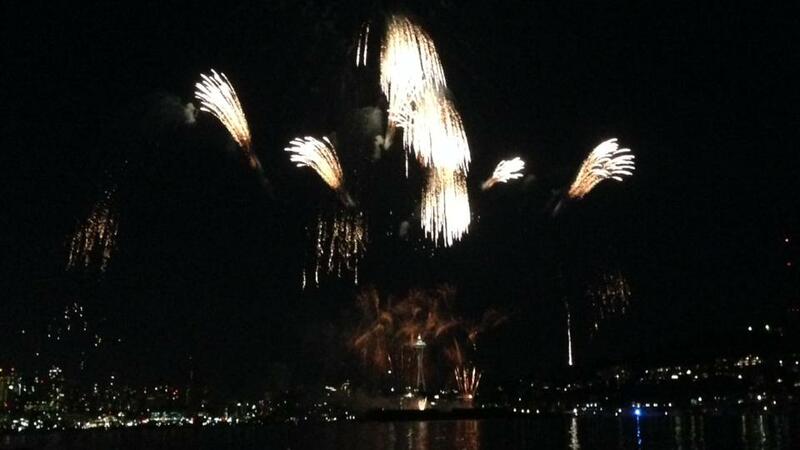 Even before I moved to Seattle I’d been to the fireworks at Gasworks Park on Independence Day. You have to get to the park early and cram yourself in between thousands of other people. For the most part you get a decent view, after all the event takes place in the sky. But you definitely can’t sit down and it’s hard to feel the thrill of the moment as you feel the point of an elbow. In a bring-your-own-chair situation we took our kayak out on Lake Union and accidentally did everything perfectly and had an amazing time. We didn’t launch until all the speedy motor boats were parked (without realizing how smart that was, since we didn’t have to battle choppy water or be on the lookout for hundreds of boats). Then we went to the “front” (police boats keep a section clear for firework debris so there’s a ring of front spots with boats parked in both directions) to see better, which also ended up being smart because it gave us time to get near the shore when the show was over. The whole evening was pretty unforgettable. I highly recommend going, but be safe: assume every boat has a drunk driver, have headlamps and other boat lights, and save your own drinking until after you’re off the water. We have talked about finding a place in the Houston are to do this. It sounds like fun. Being on the water in the evening and into the night is cool. I agree with you though. Power boat people down here like to race me in my kayak or get their wake to flip me. So we generally avoid them.